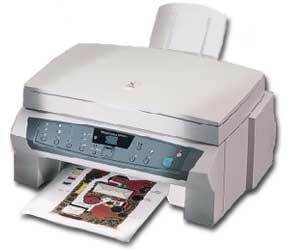 The Xerox XK35C is a one piece scanner and color printer. If you need to reproduce documents, letters or photos in either black & white or color, without tying up or even needing a computer - this is the machine for you! With the XK35C, you no longer have to fire up your computer just to make a copy. When attached to a computer running Windows 95 or 98, the XK35C can function as BOTH a scanner and a printer -- perfect for a small home office, tight on space. The printer features a 1200x1200 dpi printing resolution and a 600x600 dpi copying resolution, which is better than most fax machines, which sometimes get used as copiers in home office environments. The copy speed is 3 ppm in black & white and about a page and half per minute in color. The speed varies, depending on the size of the colored area on the page. Depending on the color density of your photos, you can make approximately fifty 8.5" by 11" prints with one multicolor cartridge. The control panel lets you quickly change the size, color contrast, number of copies as well as making black-only copies. Unfortunately, it isn't possible to tell when you will run out of an ink color, unless you are connected to a computer. This printer/scanner combination is quite capable and is priced at about $300. I have made hundreds of black & white copies with it and several with 2 and 3 color inserts. It's great to have the capability to copy in color, without having to go out to a copy store or fire up the computer. This is a truly versatile machine and can be used quite successfully by a non-computer user to make consistently good quality copies (after all it is a Xerox). When attached to a computer, it becomes a good quality color printer and scanner. That's why I own one and I also recommend it. If you want two separate units to print and scan for about half this price, but lose the "non-computer/computer off" copy feature, read my review of the Umax 1220P and Lexmark Z11 combination.